Bike Leathers for Genesis 2 Male for use in Daz Studio 4.8. There was a problem with the visor 3Delight Material file which I hope is now fixed. Pants, Jacket, Helmet, Boots and Gloves. Helmet can have open or closed Visor. Visor can be clear or tinted. I have also included several Textures, in both 3Delight and Iray. Still new to Iray so I hope they work OK. Finally, my villains have a proper wardrobe. Much thanks! Another great product which rivals anything in the DAZ Store.. Excellent quality, thanks so much..
Wow! What a fantastic work! Thank you so much! Problem with visor 3DElight material, so have updated the file. Hope it is OK now. Thanks marcoio but I have no idea how to put that right. It was a free shader (Ultimate Shader Pack from ShareCG) that I applied and I don't know how to use the Shader Mixer to change it. This is just super! Thank you! I can see you put a lot of work into this. Nicely done. Can't wait to try them out! Bravo and thank you!! A great set! Perfect for fans of races! Thank you! Thank you! 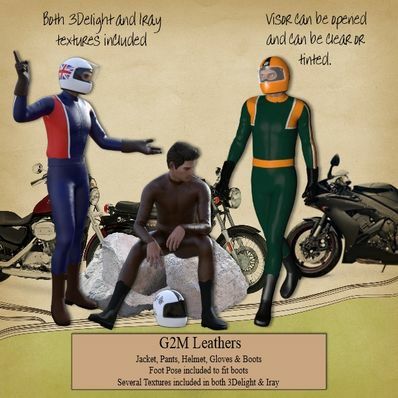 Have used auto-fit on many of your items from g2f and g2m to fit G3F, works very well as you mention here! Fantastic works! Even Genesis 1 and V4(with clone) can be refitted to g2f then on up to g3f if you have the time and patience. Nice set! At last, a hero suit that doesn't require super-powers to get into. This is awesome! Even if the Iray textures don't work, you do great work anyways! Besides, Iray is still a fairly new render engine! It takes time to get to know such things. 3Delight is good enough for me! THANK YOU for the wonderful outfit! LOL And I just bought that superhero outfit so I could have Racing Leather. Thank You! Auto fit works quite well on G2F and G3F apart from the boots. Wow, iRay textures too - you're amazing, thank you! This is outstanding! Thanks so much for sharing all of your hard work! Your content for the G2 Males is better than most of DAZ Studio. Thanks a lot for this great outfit(s)!! !